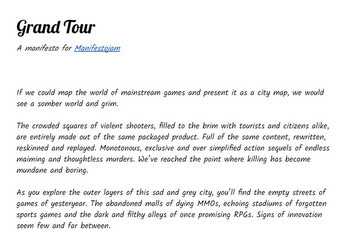 If we could map the world of mainstream games and present it as a city map, we would see a somber world and grim. 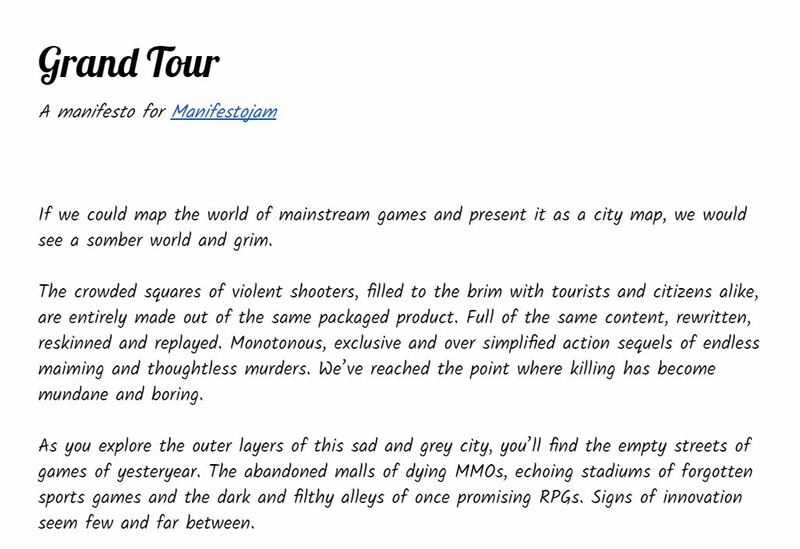 The crowded squares of violent shooters, filled to the brim with tourists and citizens alike, are entirely made out of the same packaged product. Full of the same content, rewritten, reskinned and replayed. Monotonous, exclusive and over simplified action sequels of endless maiming and thoughtless murders. We’ve reached the point where killing has become mundane and boring. As you explore the outer layers of this sad and grey city, you’ll find the empty streets of games of yesteryear. The abandoned malls of dying MMOs, echoing stadiums of forgotten sports games and the dark and filthy alleys of once promising RPGs. Signs of innovation seem few and far between. Surrounding the city is the suburban of sad platformers and reskinned puzzle clones. Slowly they fade into the rural areas of second rate sandboxes and survival horrors; all built on the same lifeless foundation as their triple A relatives downtown. As far as the eye can see they stretch towards the horizon, seemingly built entirely to discourage daring explorers, and direct them back inwards to the city center, of the next generations of stale first person shooters. But there is a place. Outside of the province of these common stagnated genres and sequels, across the banal seas of unoriginality, there are wondrous worlds to explore. Worlds so diverse, inclusive, fresh and alive; filled with new experiences, mechanics unplayed, colours unseen and emotions unexplored. It is with this rite of passage where you will grasp an unparalleled understanding on the ethical and social realities of this shared world of ours. It is with this journey of indies that your perception of possibilities transcends your imagination. And it is on this Grand Tour of games I offer you to join me on.